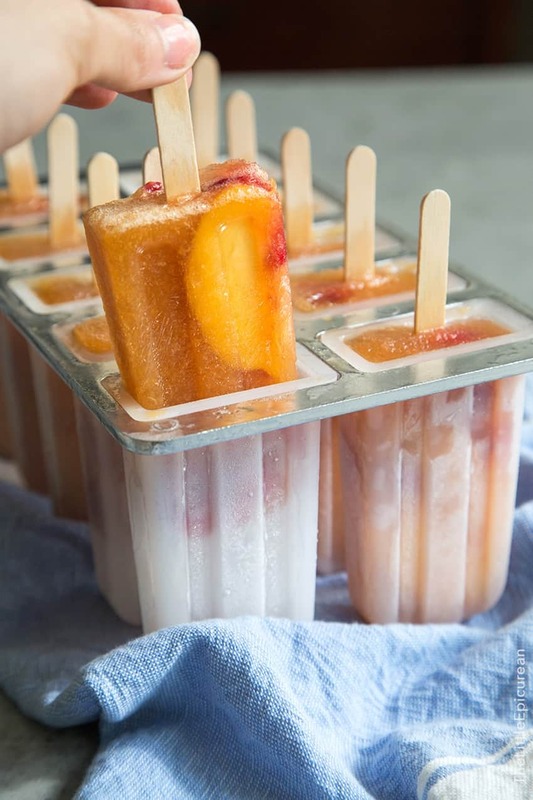 These raspberry peach sangria popsicles pack all the punch of your favorite summertime beverage into a portable frozen treat. Have your sangria and eat it, too! Let’s be honest. Rosé IS summer water. 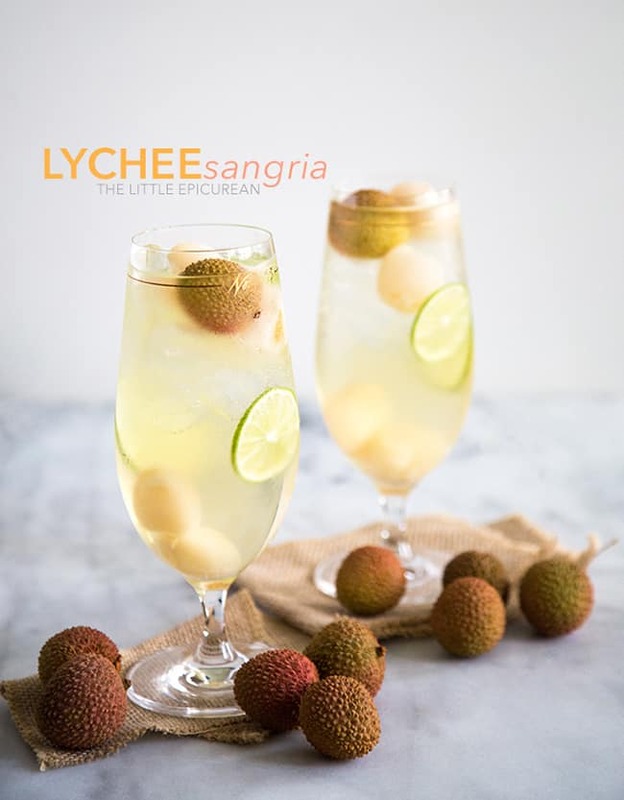 During these hot months, you’re allowed to drink it anytime of day, with or without a meal and no one will bat an eye. Is this just an LA thing? I’d like to believe it’s a national (maybe world wide) occurrence that everyone enjoys. 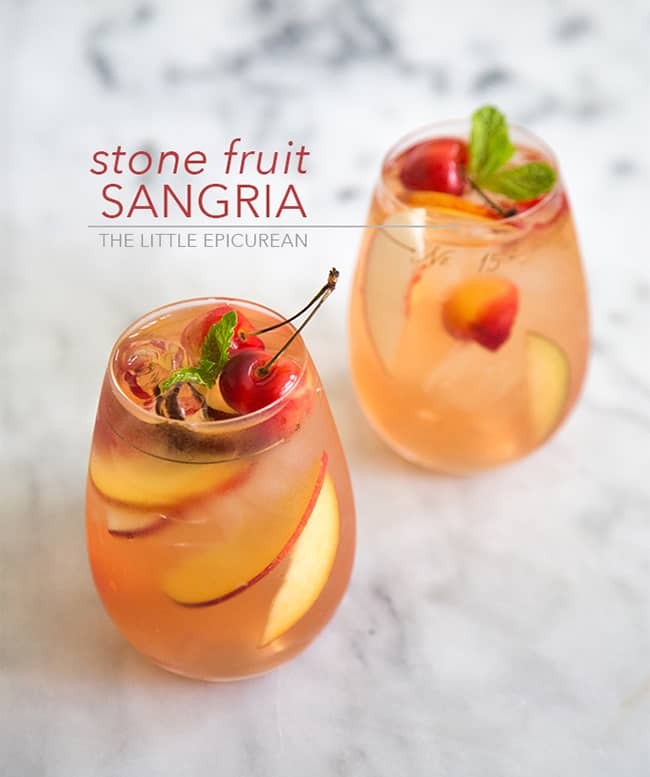 My new favorite way to enjoy rosé- in sangria form. Not just any kind of sangria, SANGRIA POPSICLES! Sangria has come to take new meaning over the years. Sangria has come to encompass any sort of fruit and wine mixture. I can’t think of any other word to describe the deliciousness that ensues when fruit and wine collide. Boozy popsicles recipe can be a bit difficult to create. You have to find the perfect balance between alcohol and freezable liquids to create a solid form. 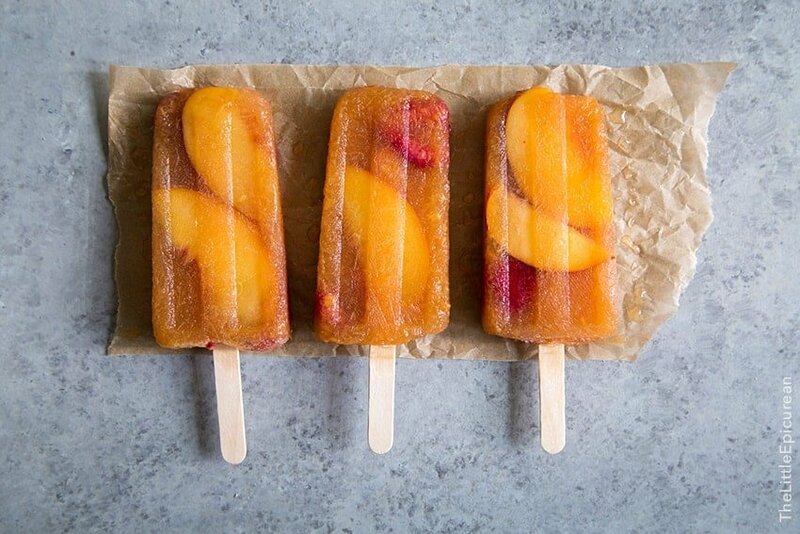 I’ve found a champion with these raspberry peach sangria popsicles. Using a puree of rosé, raspberry peach liqueur, and fresh peaches, I’ve found a way to freeze sangria. 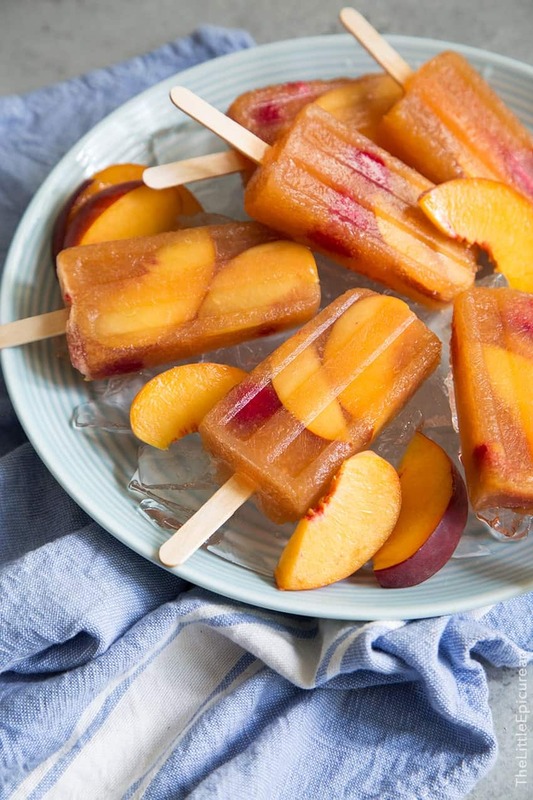 The peach puree really helps to give these popsicles body. Since these popsicles do have a significant amount of wine, they will be a tad bit slushy and icy, however it will maintain it’s structure. It’s not just fruits suspended in ice. 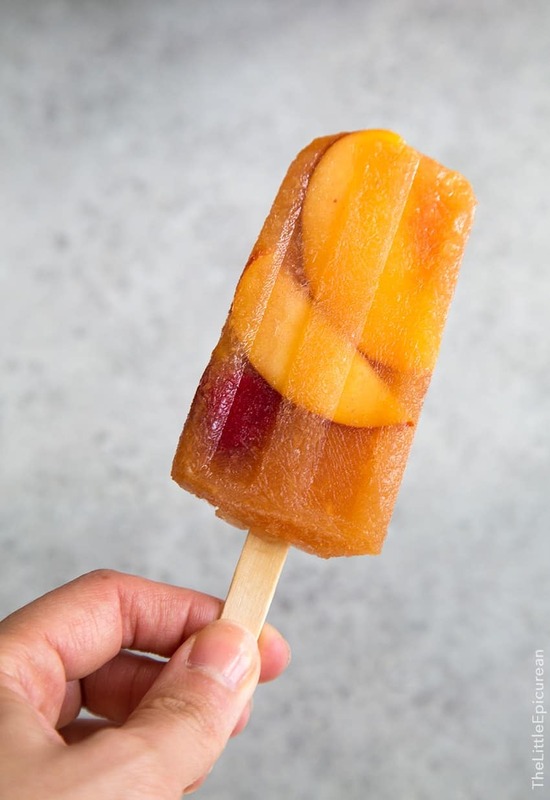 The bite-able ability of these popsicles allow you to nibble on the semi frozen fruit while enjoying all the juiciness of the sangria. My popsicle molds definitely get worked overtime during the summer. I’ve got a lot more popsicle recipes coming up! In a bowl, toss together sliced peaches, lime juice, and 1 tablespoon of sugar. Cover with plastic wrap and allow to sit for 20 minutes until peaches expel juice. Place peach mixture, remaining 1/4 cup sugar, wine, and Grand Marnier raspberry peach in a blender. Process until mixture is smooth. 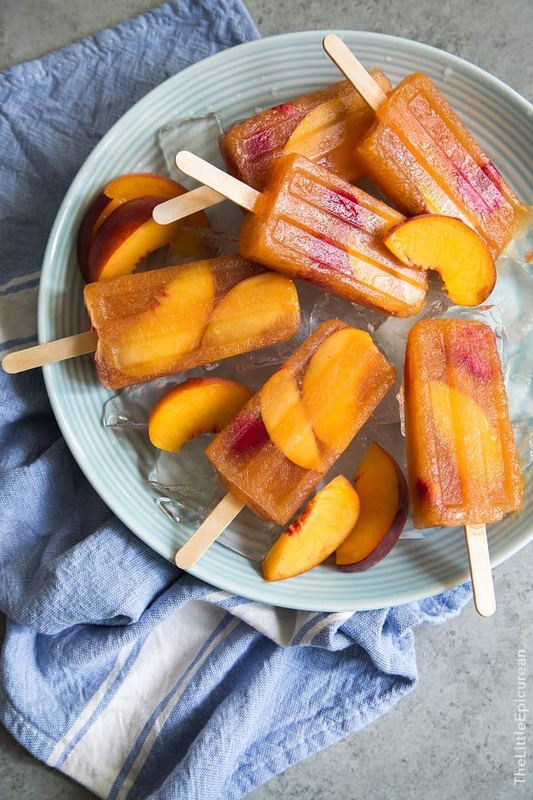 Place peach slices and raspberries in the popsicle mold. Use chopsticks or the back of spoon to help press fruit into the sides of the mold. Gently pour liquid mixture into the popsicle mold. Insert wooden popsicle sticks. Freezer for at least 6 hours until popsicles are solid. I used this popsicle mold from Amazon. 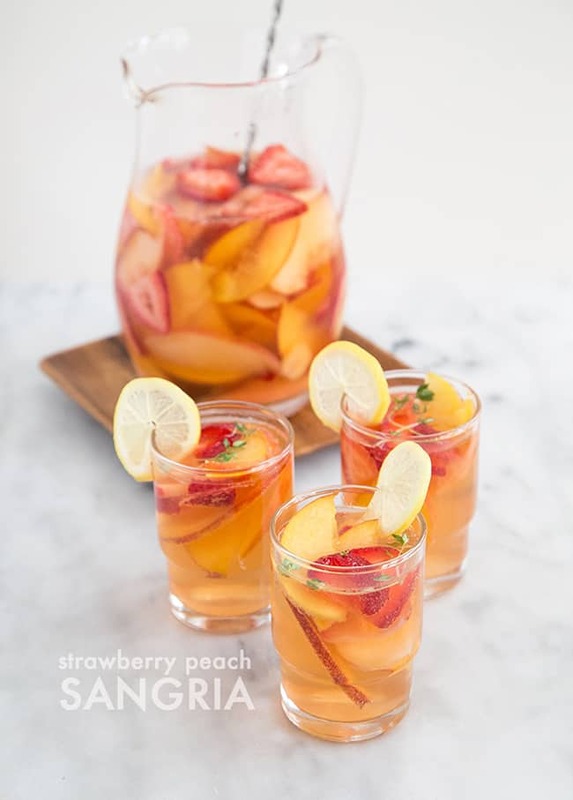 If you cannot find raspberry peach liqueur or peach vodka, you can substitute it with peach brandy, regular Grand Marnier, elderflower liqueur. I can’t say that I see a lot of people on the East Coast drinking a lot of rose in the summer, but you are right, it needs to become a national thing. I love me some rose! These popsicles sound incredible! I have a feeling I might not be able to wait until they are frozen to take a few tastes. You know, for quality control.